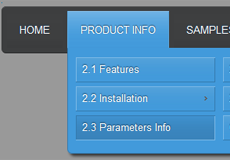 Hello css3menu - just purchased your product. I love it and I'm glad I finally have a full version. I'm wondering - the list of icons are very small and hard for me to make out. Is there somewhere I can view them larger? I have downloaded the free version on three different occasions over the last week and all give the same error. I am using Win 7 Pro with SP1, current on updates. I have an AMD Phenom II X4 processor with 8 gb ram. October 02, 2013 Is it possible to make floatable menu with vertical dropdown menu css? I'd like to insert a floating menu into my website and was wondering if it is possible with your menus?